12 oz., 16 oz., 22 oz. Whether you love to get hop stoopid or prefer a more subtle inclusion of this key beer ingredient; there is a lot to know about our friend Humulus lupulus... We hope you enjoy this overview and the links to some of our favorite articles and resources. See you at the shop! Hops are the female flowers (also called seed cones or strobiles) of the hop plant, Humulus lupulus. They are used primarily as a flavoring and stability agent in beer, to which they impart a bitter, tangy flavor, though hops are also used for various purposes in other beverages and herbal medicine. In the Middle Ages beers tended to be of a very low alcohol content and were commonly consumed as a safer alternative to untreated water. Each village tended to have one or more small breweries with a barley field and a hop garden in close vicinity. Early documents include mention of a hop garden in the will of Charlemagne's father, Pepin III. However, the first documented use of hops in beer as a flavoring agent is from the 11th century. Before this period, brewers used a wide variety of bitter herbs and flowers, including dandelion, burdock root, marigold, horehound (the German name for horehound means "mountain hops"), ground ivy, and heather. 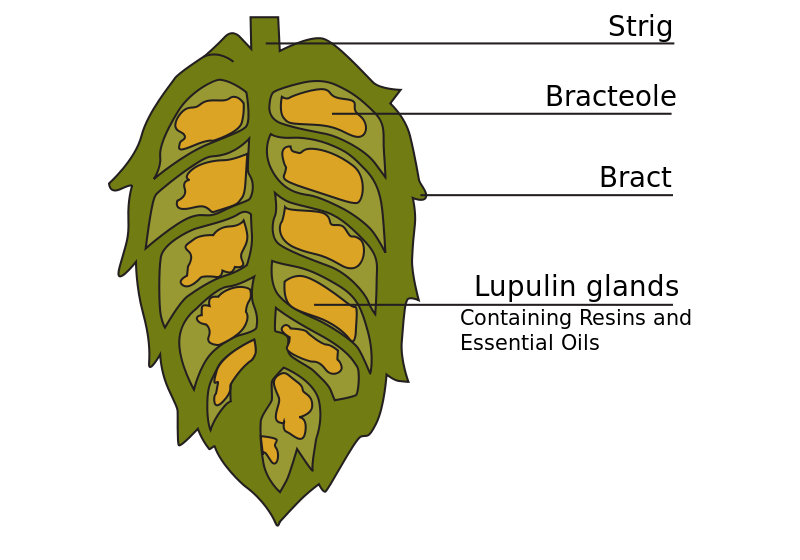 Hops are used extensively in brewing for their antibacterial effect that favors the activity of brewer's yeast over less desirable microorganisms and for many purported benefits, including balancing the sweetness of the malt with bitterness, contributing a variety of desirable flavors and aromas. Historically, traditional herb combinations for beers were believed to have been abandoned when beers made with hops were noticed to be less prone to spoilage. The hop plant is a vigorous, climbing, herbaceous perennial, usually trained to grow up strings in a field called a hopfield, hop garden (nomenclature in the South of England), or hop yard (in the West Country and U.S.) when grown commercially. Many different varieties of hops are grown by farmers around the world, with different types being used for particular styles of beer. It wasn’t too many years ago when most recipes that referred to adding hops usually only mentioned the variety of hops used, the amount, and not much else. This system worked relatively well at a time when hops were available in a few limited varieties and the freshness and quality were often questionable. But as the hobby evolved and became more sophisticated, a better, more precise way to calculate potential bitterness in a homebrew recipe was needed. Click on the link below to download our order form!